On Monday night, Kobe Bryant became the first NBA player to have two jerseys retired by the same team, as No. 8 and No. 24 rose into the rafters in front of the jam-packed, star-studded STAPLES Center in Los Angeles. Lakers President of Basketball Operations Earvin "Magic" Johnson and Lakers president, majority owner Jeanie Buss, spoke during the halftime ceremony that culminated with a double jersey reveal and Bryant on the microphone. Standing at center court, Buss explained the decision to retire both of Bryant's jerseys by stating that if one looked at Bryant's career with No. 8 and No. 24 separately, "Both of those numbers would qualify for the Hall of Fame." Traditionally, the Lakers only retire jerseys for players inducted into the Hall of Fame. Bryant's eventual induction is a mere formality given his body of work. Bryant won three NBA championships and scored 81 points in a game while donning the No. 8. Then, a decade into his career, the Philadelphia native changed his number to 24 and went on to claim two NBA championships, two NBA Finals MVPs and a league MVP wearing No. 24. Separating the two decades into two players would have created two Hall of Famers, so Buss' argument held weight. Monday's celebration at Staples Center started hours before the game with a "Kobeland" carnival and street fair honoring Bryant's No. 8 and No. 24. Hoards of fans came out to enjoy the games and activities. The festive atmosphere carried into the arena for a spirited first half between the Lakers and the visiting Golden State Warriors. At halftime, the spotlight shone brightly on Bryant to reveal two jerseys with an audience of all-time greats looking. From Bill Russell to Kareem Abdul-Jabbar and Allen Iverson to Shaquille O'Neal, Bryant's ceremony brought out some of the greatest names in the history of the hardwood. "One of the first things I did when I walked into the [Great Western] Forum, when the lights were down, it was dimly lit, I looked up and looked at all the jerseys up there because I'd seen them many times on the video tapes before," Bryant said, explaining the gravity of the occasion and what it meant to him prior to the game. The man of honor added, "Before every game, I made it a point to kind of glance up there and remind me of what I'm playing for." With the two jerseys lit up and the ceremony all but wrapped up, the retired basketball star finished up by thanking the fans and his family. 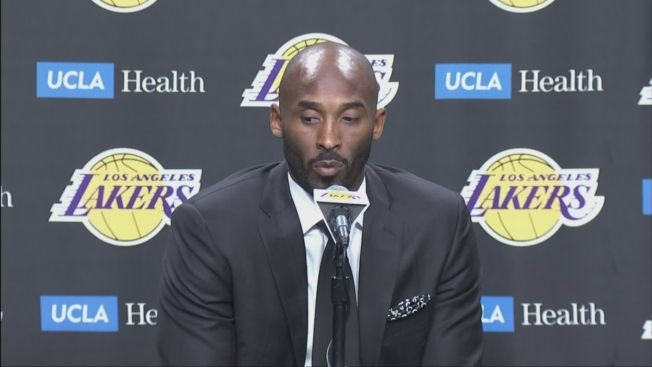 Finally, Bryant concluded the ceremony with his now famous catchphrase: "Mamba out."